Kim Bailey is no doubt bored with talk of him being a resurgent trainer. True, the star of the 1990s hit rock bottom, only a few years after success in the Grand National with Mr Frisk (1990), the Champion Hurdle (Alderbrook, 1995) and the Cheltenham Gold Cup (Master Oats, 1995). The flood of winners from his Lambourn, Berkshire HQ - 86 in the 1993-94 season - soon turned into a disillusioning trickle, reaching a low point with just three successes in one campaign. However, from a new base close to Cheltenham, the bounce back has been under way for some time, and is largely complete. Despite the Bailey team heading for its biggest seasonal total in years, the revival talk still continues, but the chat now is all about moving to the next step - a return to the sport's big time. Harry Topper is seen as having the potential to emulate Master Oats in a future Gold Cup while The Rainbow Hunter has each-way supporters for the Grand National. Only a few months short of his 60th birthday, such a topsy turvy CV has proved a sobering and thought-provoking experience for Bailey. "The awful thing about it," the trainer said, "was that you took it totally for granted because you went to the racecourse with four runners, and you expected two winners. "It's only when you don't have the horses that you realise how hard it is to get back there, and how easy it is to fall from that area." Pressed on what sent things sour, Bailey, who found himself a gossip column regular when going through a long divorce case with first wife Tracey, went on: "I think a lot of things went wrong for us. "I moved away from Lambourn and went up to Northamptonshire, which turned out to be a disaster. "I had an all-weather gallop washed away [by heavy rain] and loads of things went wrong. "Perhaps it was someone up there [points to the sky] saying 'it's time you sat back and learnt again'." These days, the progress made at Thorndale Farm, Andoversford is striking. Harry Topper and The Rainbow Hunter are only two out of nearly 60 inmates, on which top jockeys Jason Maguire and Nick Scholfield are the principal riders. And Bailey's popular daily blog has a noticeable spring in its step as he takes aim at everything from race conditions to his friend and neighbouring trainer Nigel Twiston-Davies. With wins at Exeter and Newbury, six-year-old Harry Topper is emerging as one of the season's outstanding young steeplechasers. He is due to go for a valuable race back at the Devon track on 10 February before a possible tilt at the John Oaksey National Hunt Chase for amateur jockeys at the Cheltenham Festival in March. The Gold Cup will be on the agenda next year. "He's still very, very weak and desperately immature," Bailey said, "but he's got that one passion in life which is that he'll run until he drops. He'd run into a brick wall for you. 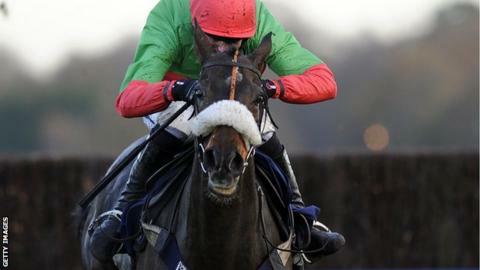 "The National Hunt Chase is a tentative entry. I did say he wouldn't go to Cheltenham, but the four miles should be fine. We'll need good to soft ground and a decent amateur. "People have talked about the [shorter] RSA Chase, but he's too inexperienced and not quick enough yet, and it looks like a very competitive race." The Rainbow Hunter, one of 84 entrants for the Grand National on 6 April, is expected to get into the race with around the minimum weight in the handicap of 10 stones. Rather more diminutive than a conventional Aintree contender, the horse, described by Bailey as "small, agile and tiger-like", won at Ascot before getting stuck in the mud in a race around Chepstow. He is rated a 50-1 outsider, but before dismissing his chances, remember that at his lowest ebb, Kim Bailey was three times those odds ever to resurge, and look what's happening today.